This is loosely based on Hugh Fearnley-Whittingstall’s terrine recipes. He refers to building a terrine with bricks (the meat) and mortar (the forcemeat). It’s an appealing analogy, not least because it shows you don’t have to be too scientific about the whole thing. Serve it with red or white wine, crusty bread and chutney. Heat the oil in a frying pan and cook the duck fillets for 2–3 minutes over a high heat until browned. Set aside and brown the pigeon and pheasant in batches. Season well and allow to cool. Preheat the oven to 170°C, gas mark 3. Grease a 1.8 litre terrine or 900g loaf tin and lay the bay leaves along the bottom. Stretch the bacon rashers with the back of a knife; Line the tin with them, leaving a little overhang. Reserve 3–4 rashers. For the forcemeat, put the bread, sage, parsley, juniper berries and garlic in a food processor; whizz to make breadcrumbs. Add the sausage meat and liver and blend again. Add the egg and Madeira, season well and pulse briefly. Spread some of this in the terrine and press in a few strips of game. Cover with more forcemeat and continue to layer, finishing with forcemeat. Fold over the overhanging strips of bacon; patch with pieces of reserved rashers. Cover with foil. Place in a roasting tin and half fill with boiling water. Cook for 1½ hours till the juices run clear and a skewer inserted into the centre is hot when removed. Remove from the oven and pile 5 tin cans on top of the foil; leave for 2 hours. Put in the fridge, still with the weights on, for 2 hours. Once cool, cut into slices. 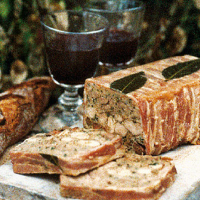 The Corker recommends- This beautiful terrine deserves a splendid partner, a white burgundy fits the bill. This recipe was first published in Mon Oct 01 01:00:00 BST 2007.